This is really a key issue. This is not an intellectual game or "news as relaxing armchair entertainment." The Intelligence Reform Act of 2004 and the Real ID Act of 2005 establish an ominous national ID system, "forcing all states to standardize" biometric-laden birth certificates, drivers licenses and other ID cards. By 2008, personal data from these will be flowing into the Fuhrer's central database. This is a statement overtly supporting GENOCIDE. This is not politics as usual. What would you think if the President of the United States said this? All his staff have signed off on it. Would you care? Would you worry about your own genotype? In fact, this quote from the Project For The New American Century (PNAC) is from its 2000 document "Rebuilding America's Defenses." 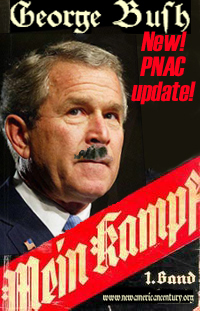 You are unable to organize a eugenic bioweapon driven Holocaust like PNAC wants without detailed individual genetic-biological lists, courtesy of, in the U.S. from 2008, a microwave based RFID file system with individual required bio-information-genetic markers carried at all times as an internal passport, mandated by the State; Bush learns from Third Reich well, same exact eugenic strategy different technical solutions [cite: IBM and the Holocaust]; Bush is organizing the next Holocaust via microwave RFID (Radio Frequency Identification). Ban all uses of these frequencies now. I don't know what this Wiki article is talking about later though; there were indeed several of these styles of circular prison society systems built in the United States. The Intelligence Reform Act of 2004 and the Real ID Act of 2005 establish an ominous national ID system, "forcing all states to standardize" biometric-laden birth certificates, drivers licenses and other ID cards. By 2008, personal data from these mandatory identifiers will be duly flowing into the Fuhrer's central database. While coming to power over all law enforcement agencies with its directives and funding hooks, DHS is also regimenting the U.S. medical establishment to collect and forward all health data to Information Central. The medical history [and DNA database is expanding fast] of every citizen's private parts will soon be efficiently forwarded from the examination table directly to Big Brother's electronic health records database. This is not politics as usual. What would you think if the President of the United States said this? All his staff have signed off on it. Would you care? Would you worry about your own genotype? In fact, this is a quote by a group called the Project For The New American Century, and its 2000 document "Rebuilding America's Defenses." Chief executive officer for eHealth Initiative, Janet Marchibroda, confirms that national standards and policies are being developed for "connectivity" no matter where in the U.S. a citizen might receive his hemorrhoid or herpes diagnosis/treatment. Centralized medical surveillance will certainly leave no citizen un-jabbed when Homeland Needle Nazis unleash their stash of disabling, compulsory lipid-laced vaccines during a "national emergency." DHS (Department of Homeland Security) and dozens of medical facilities across the nation now encourage the use of RFID microchips which can be implanted under the skin. At least 68 hospitals and medical facilities are already using Applied Digital Solution's VeriChip, recently approved by FDA (Food and Drug Administration) for human implantation. Each VeriChip, implanted under a patient's skin between the elbow and shoulder, contains a 16-digit identification number, readable by a chip scanner blasting kilohertz radio frequency. Meantime, DHS has announced its quest for powerful new reader technology that could obtain information from ID microchips attached to either a human or a vehicle, even if the human is 25 feet away; even if the vehicle is moving at 55 miles per hour. On March 30, 2006, Ingri and I traveled from Spirit Lake to Seattle to attend what turned out to be an excellent 9/11 truth event on the University of Washington campus. What we experienced with regard to measurable amounts of ambient electromagnetic radiation was shocking to us and occupied much of our conversation throughout our journey. Wherein previous years there would be miles between measurable amounts of radiation being detected by our zapchecker, the opposite was suddenly true. We noticed that our zapchecker was spiking about 90 percent of the time during our 800-mile round trip. When we were in urban areas, the zapchecker was solidly spiked-even when the sensitivity of the device was turned down. We are amazed at how quickly our world came from being irradiated only in spots to being saturated with this odorless, tasteless and invisible danger. Like it or not, except in isolated areas, we are bathed in ambient radiation. All of us living in a [microwave panopticon] radiation-intensive police state are at high risk for heart, blood and circulatory problems, especially high blood pressure and stoke. Hey, you cops out there with your in-vehicle laptops and radar guns and wireless cameras-hope you're having fun in your stroke-mobiles! In the late 1990s, scientists confirmed that chick embryos exposed to cell phone radiation during their 21-day incubation period were five times less likely to survive than unexposed chicks. In 2000, Dr. Ross Adey researching at UC Riverside reported studies showing that pregnant rats exposed to Iridium cell phone radiation produced fetuses with significantly decreased brain activity compared to non-exposed fetuses. In 2002, the Associated Press reported that DNA and chromosomal damage caused by ionizing radiation and other radiation has profound ramifications for the offspring of people thus damaged. According to researchers at the University of Leicester, radiation damage suffered by parents can be passed on to children and grandchildren.. Researchers have long warned that mothers using a cell phone headset, causing her to place the phone near her abdomen during pregnancy, could expose the fetus to dangerous levels of microwave radiation which the fetus can readily absorb. In 2002, the French government warned teenagers to keep cell phones away from their developing reproductive organs..
By 2004, researchers in Hungary found that men who carried a cell phone on their bodies - even on standby - had significantly lower sperm concentration. The motility of the sperm they did produce was reduced and sperm movements were abnormal... University of Washington researchers documented reproductive changes in lab animals occurred at exposures many times less than the FCC's SAR exposure guidelines. Thousands of young women working in retail companies and offices across the U.S. [and everyone working in many supermarkets, strapped on the middle of their backs right against their spine] are now wearing on their bodies a variety of microwave-driven communications devices throughout their shifts. Many of these devices are worn in pockets or on waist bands, exposing their ovaries to microwave radiation. Many of these woman at any given time are unknowingly pregnant and exposing their fetuses to DNA damage. The crime is that "neither industry nor regulating agencies are warning Americans" about these dangers "nor are they doing follow-up studies" on women who have exposed their fetuses. When their children are born with defects and illness, parents have no way to prove that wireless radiation was the cause. Scientists now suspect that there may be a correlation between autism and fetal or neonatal exposure to radio frequency radiation. One in six U.S. children suffers some neurological disability and the rate of autism has skyrocketed in the last decade. Dr. Ross Adey of the University of California Riverside showed that a pregnant rat's exposure to cell phone radiation alters the activity of an enzyme in fetus brains, indicating stress. In a radiation-intensive police state, the already polluted unborn conceived by radiation-damaged parents are at ever-increasing risks for genetic deformities, brain damage and death. Perhaps we now have clues as to why approximately one half of all pregnancies in the United States result in death of the baby--either before or after birth--or in a less than healthy baby. Police State USA will never tell us the truth about the radiation they are using against us with such a vengeance. Deliberately kept dumb as dirt about the issue, Americans are cornered rats who "have never had the privilege of giving informed consent" for this abuse and brutality. We all now stand between a ruthless political machine that would snuff our lives without a blink and the equally serious repercussions of political resistance. Can we educate enough people in time to mount effective resistance? Can we hold the line until this fascist administration - and the murderous corporate horse it rode in on--finally destroy themselves with their own excesses? RFID "National ID" public monitoring in South Madison getting in place? What are these things on electric poles?